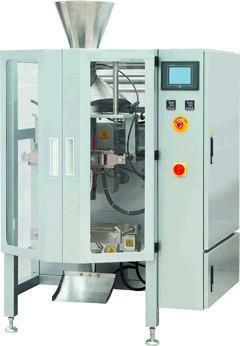 Vacuum film feeding devices, gusset devices, retainer devices, hole-punching device, link bag device. 1. New design with perfect fashion, more reasonable structure, more advanced technology. 2. Imported PLC control system, colorful touch screen, easy operation, intuitionist and efficient. 3. Standard positioning with imported servo film transporting system and mark sensor, superexcellent capability for complete machine, perfect packaging. 4. with auto warning protection function to minimize loss 5. Various kinds of bag, it could provide the pillow bag, angle fold bag, hang hole bag, link bag, etc. 6. Automatic correct function, save time, labor, and film, the operation more intelligent. 7. Adopt external film feeding mechanism. Film setting be more easy and quick. Suitable for automatic packaging of various kinds of leavened food, candies, peanuts, seeds and such materials in grain or piece as well as powder like milk powder, washing powder, starch, etc.